This chapter continues the review of MCS operational procedures with a focus on patrols, boarding and inspection procedures, navigational positioning, evidence gathering and handling, and preparation for prosecutions. Integrating the use of information from different surveillance methods (e.g. land patrols, patrol vessels, aircraft and satellites) results in a more cost-effective operation. For example, the information from satellite imagery and VMS, especially for larger vessels, will allow a State to target air and sea patrols on areas or vessels of concern, as opposed to random patrolling. All patrols should commence with a planning and briefing session for key participants to ensure that everyone knows what to expect. Upon completion of a patrol, de-briefing of key participants should be carried out, with appropriate documentation for record purposes and for confirming follow-up actions and lessons learned as required. 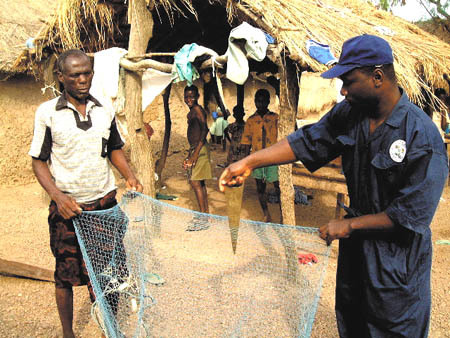 Land patrols along rivers, lakes, and coastal areas can be effective if focused on fishing activity, areas of historical illegal activity or zones where the fisheries resources are particularly vulnerable to over-exploitation by licensed and non-licensed fishers. Coastal areas where domestic artisanal fishers operate can be monitored for incursions by unpermitted larger vessels. Intelligence reports can be relayed to specific coastal areas for action. Use of coastal radar for these coastal patrols will enable effective planning, risk assessment and again, the focusing of resources. Random air patrols are often conducted when there is an absence of reliable fisheries information or current intelligence regarding potential violations. The endurance time of the aircraft will determine how many priorities can be addressed in a single patrol. The aircraft crew should be briefed on the patrol area and provided with a summary of authorized vessels and their markings and the expected activity in the zone. If possible, the patrol aircraft should link directly to the VMS system cross-referenced with its own radar to increase the flexibility and effectiveness of the patrol. A high transit to the patrol area is recommended for both fuel efficiency and to increase radar coverage. This strategy also increases patrol time on station. Priorities should include: closed areas; patrol routes to detect and prevent incursions of offshore vessels, and areas of heavy fishing concentrations where non-licensed vessels may mix with licensed vessels to screen their illegal fishing operations. If stocks migrate near the boundaries of a State's fisheries jurisdiction, foreign offshore vessels may be tempted to follow the fish into the EEZ if they believe the risk of detection and apprehension is small. The new VMS systems, satellite imagery, and radar technologies, working in unison with air surveillance platforms, can provide information to effectively deploy other resources such as offshore patrol vessels. Coastal patrols are most effective if smaller patrol vessels are deployed to areas of fishing concentrations and operate from a base in this area to provide a timely response to fisheries conservation needs. In this manner, the patrol vessels can monitor the coastal fishing fleet. The presence of a fisheries patrol vessel can also contribute to fisher safety, but this can be abused. In some areas the use of coast watchers and reef watchers from the local community has increased community involvement in the management and MCS process, and has strengthened joint stewardship of the resources with the government. Offshore patrol vessels are usually the most costly of patrol assets, but are necessary for actual apprehension operations. It is most cost-effective if these assets can be targeted to trouble spots. It may be possible to use diplomatic channels to bring a vessel to port, but this may not always be possible without greater international pressure than a single State can exercise. Each patrol vessel should have the necessary equipment to carry out assigned duties, e.g. clear identification that it is on government service, clear MCS officer identification, copies of regulations, inspection gear, including a handheld GPS if possible, communication and safety equipment. Patrol checklists are provided in Table 1. The master of a patrol vessel must determine if weather and sea conditions permit a safe boarding. The Fisheries Officer is the leader of the boarding team and must decide if the boarding party will actually board a particular vessel. On a fisheries patrol there should be no doubt that the patrol vessel is for support of the fisheries activity. The Senior Fisheries Officer is in operational command of the patrol (what areas it will cover, etc.) while the Captain is responsible for the safety of the vessel and crew. The Fisheries Officer should ensure that notes of observations of all activities on the vessel to be boarded and responses to communications are made from the moment the vessel is sighted. These observations may prove very useful if there is an alleged violation and can assist the prosecutor in successfully prosecuting the case. Dates, times and events should be carefully recorded by designated fisheries staff and boarding personnel both in the boarding team and onboard the patrol vessel. · Current Status of activities. · Objective of the patrol. · Area of the patrol. · Tolerance level, if any. · Expected duration of the patrol. · Rules for USE OF FORCE/Rules of Engagement (Protection only). · Expected boarding type - routine/opposed or hostile, etc. · Communications - Call Signs of participants; frequencies for monitoring and safety (HF 2182 Mhz and VHF Channel 16). · Special instructions for particular situations or patrols. · Questions from the patrol vessel crew. · Navigation equipment - radar, GPS, echo sounder, charts, DF. · Ship's logbook open and duly noted for the commencement of the patrol. · Radios for ship-to-shore, boarding boat and boarding team. · Boarding boat, life jackets, binoculars, rifle, hand guns, flares, boarding flags. · Raise international fisheries pennant to show that you are on a fisheries patrol. Many States board fishing vessels by bringing the patrol vessel directly alongside. This is not normally recommended as it places the patrol vessel and the entire crew at risk. As noted earlier in the report, a small boarding craft to carry the boarding team is recommended. This leaves the larger patrol vessel in a position to observe and monitor the safety of the boarding party. Language differences may pose an initial concern for both fisheries officials and foreign vessel masters. There are two common solutions to this problem. One is to require that logbooks and reports must be completed in the language of the coastal State. The responsibility then rests with the foreign vessel to make any translations. Alternatively, some States obtain copies of the relevant logbooks, reports and documents from the foreign vessel and make the translations themselves. A further tool is a small handbook of questions in various languages with a common numbering system so that the appropriate numbered question can be asked and shown to the fishing vessel master in his/her language. This procedure has been used effectively by many fisheries organizations. Where possible, at least one member of the boarding team should be able to understand the language of the master of the vessel being boarded. A check list for pre-boarding, the boarding kit, and for the approach for boarding is set out in Table 2. · Weather and sea state. · Type of boarding - routine/resistance expected. · Boarding team composition and order for boarding. · Boarding team tasks - radio communications, security of crew, note taking on both the patrol vessel and boarding boat, search of vessel, etc. · Communications - call signs and frequencies. · Security cover from the patrol vessel. · Boarding positions of patrol vessel and boarding boat for security. · Special instructions as are appropriate. · Call the fishery officer to discuss the type of expected boarding. · Call the boarding team for the boarding briefing. · Move into a boarding position as soon as the boarding team is prepared to board. (Ensure that the boarding team is prepared prior to moving close to the target vessel so that the boarding is very closely following the announcement of a boarding - this to prevent time for the fishing vessel to destroy evidence of an infraction). · Call the vessel and notify her that you intend to board. · The "Sierra, Quebec, Three" flags are raised as the international flag signal "Heave to, I intend to board you". Alternatively one can raise the "Lima" flag that indicates "stop your vessel" immediately. patrol vessel maintains security watch and regularly checks communications with the boarding party. This section considers the actual at-sea inspection of fishing vessels. An inspection focuses on data gathering for two purposes. The first is for surveillance of the fishing operations to determine compliance with the terms of the licence, legislation and approved fishing plan. The second is to gather data for the monitoring aspect of MCS and also for future fisheries management. The verification of the logbooks should enable a Fisheries Officer to reconstruct the fishing activities of the vessel since entry into the waters under the jurisdiction of the State. In several States it is noted that even for the larger, near-shore vessels (defined as those licensed to fish outside 3-5 nm) fisheries officials do not require vessels to carry logbooks, nor do they complete inspection forms. It is recommended that logbooks be issued to all vessels, especially those engaging in commercial activities, and further that standardized inspection forms be completed for each inspection. This has a number of advantages. First, the fishing captain can then show another officer when the vessel was last boarded and the results, thus possibly shortening the inspection time and potential interference to fishing operations. Second, all actions by the officer can be recorded and directions can be noted in the logbook, i.e. no verbal warnings are given and each officer can follow-up on any discrepancies noted by a previous boarding officer. Third, this permits the recording of a compliance history of the vessel and master. Operational patrols should concentrate on those vessels or fleets with a poor record of compliance. There are cases when the boarding team consists solely of the Fisheries Officer and an assistant. Generally a minimum of four persons should be in the boarding team. In cases when the boarding team might meet some resistance, a full and equipped boarding crew (minimum of six persons) is advised. It would include: the Fisheries Officer, a navigating officer and an engineer with three crew. Table 3 provides possible check lists to follow for: a) routine boarding procedures; b) boarding with a suspected violation; and c) boarding where there may be resistance. · Radio check prior to departing the patrol vessel and again on gaining access to the fishing vessel. · Senior Fishery Officer greets the Captain and crew, identifies him/herself, asks the Captain for identification, and explains the inspection process. · One of the boarding team meets and talks with the Observer as soon as possible on boarding, if an Observer is on board. · The note taker records time and all events and reports these to the Patrol Vessel where they are entered in an appropriate logbook or daily record of events. · Check vessel position from Captain and check vessel navigation equipment. · Check vessel documents (licensing, vessel documents, fish log, navigation log, engineering log, processing logs, etc. as appropriate to verify fishing operations). · Check for transshipments and details of the operations. · Check the fishing gear and fish catch on deck. 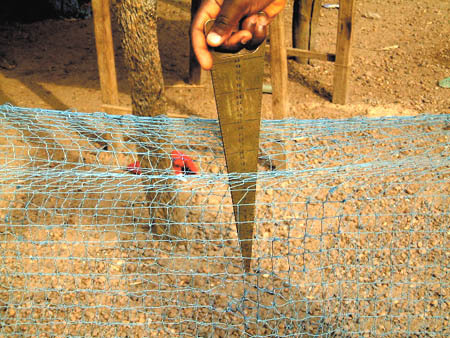 · Measure the net and check the mesh size if a net is on deck. · Check the fish storage areas and processing plant, if applicable, to get packing weights and conversion rates. · Take pictures where possible of all events - net measuring, storage, fish verification, etc. · Return to the bridge and complete the inspection report. · Draw a line under the last fishing logbook entry, sign and date the log. · Explain the report to the vessel captain and seek his signature on the form. · Provide a copy of the inspection report to the Captain, including any comments from the Boarding Team and the Captain. · If no major concerns, thank the Captain, and disembark from the vessel. Always debrief the patrol and boarding team after the inspection, complete the documents and reports, and prepare for the next inspection. · Note taking is extremely important during these events for court preparation and processes. · Tag and secure the evidence where it can be guarded or secured against tampering. · Complete the inspection report and note the infraction to the Captain. · Report the event and time to the patrol vessel. · Request the Captain to return to port for further investigation - if he/she refuses, order him/her to do so (the necessary authority to do so must be set out in the Fisheries Legislation). · If the Captain still refuses, bring additional crew to the vessel, conduct arrest procedures, remove the Captain from the vessel, and bring the vessel to port. · (Remember that upon removal of the Captain, the Patrol Vessel has immediately assumed full responsibility for the safety of the fishing vessel, equipment and crew safety). · Maintain security of the vessel and crew during the trip to port. · Notify the Base of the incident and planned action. · Ensure the appropriate persons are prepared to meet the vessel on landing to take charge of the Captain and crew and secure the vessel, e.g. Legal, Police, Foreign Representation, etc. · Secure the evidence on shore (including pictures), complete the documents to charge the accused and to bring them to trial and those for the court case. · Debrief the Base Commander and Legal Officer and arrange for witnesses for the court hearing. In cases of boarding when there is an expectation of resistance resulting from discussions and responses to halt the vessel for inspection, or other intelligence, it should not be carried out as an aggressive action. Such boarding should be planned with the sole purpose of protecting your crew and still enabling them to carry out their duties. a) During the Pre-Boarding Briefing - stress safety. b) Carefully detail the boarding approach. c) Detail boarding teams duties and check all equipment carefully, especially radios for each of the boarding teams. d) Do not board until the vessel is stopped and the crew are in a visible position on deck. (Note: Additional to other boarding is the issuance of firearms - only to trained officers). f) Boarding Order: Team 2 to secure the boarding point; Team 1 to the Bridge; and Team 3 to assist Team 2 in the crew personal security search. g) Team 2 crew security; Team 1 secures and reports control of the bridge; Team 3, when completed crew search, conducts a vessel search - REMEMBER SAFETY, SAFETY, SAFETY!!! h) If all secure, the options are to complete the inspection as planned and take action as per the routine boarding, or to take the vessel to port, or to arrest the Captain as appropriate according to the situation. NOTE 1: It may be that the Boarding Party finds no resistance on boarding and that the Captain simply did not understand the instructions from the Patrol vessel. A written warning in the fishing vessel logbook may be appropriate. The Senior Fishery Officer should continue with a modified routine boarding or continue in a hostile boarding mode as required, but it is still essential that boarding teams continue their security duties. NOTE 2: Remember again - Arrest at sea signifies a transfer of the vessel and crew safety responsibilities to fisheries personnel and the liability aspects of this should be a consideration before taking this action. NOTE 3: Note-taking and debriefing sessions are important at all times, but they are absolutely essential for all alleged violations and hostile boardings. NOTE 4: Boarding with firearms requires special training in safety and security precautions - remember these firearms are for the safety and security of your own boarding team. Particular care must be taken when using force. Typically, State officials such as fisheries officers are only authorized to use the minimum force necessary to ensure compliance with any lawful instructions that they may give. The decision as to what degree of force is deemed appropriate is always a subjective one but will be judged objectively by the courts. If a court finds that excessive force was used, the party against whom it was used may have a right to claim damages. It is suggested, therefore, that officers be required to observe strict rules regarding the escalation of the use of force. For example, if the vessel does not respond to the standard instruction to stop and permit boarding it should be warned by radio and loud hailer. Only if no response is received should force be considered to physically stop the vessel (i.e. halt or, potentially, sink it). States should ensure that appropriate higher authorities are involved in the decisions to escalate the use of force. The use of force when fired upon is usually controlled by established rules of engagement. Captains of patrol vessels have the right and obligation to protect their ships and crew. The verification of the position of a vessel is a key requirement for any fisheries sighting, inspection, or prosecution. Surveillance aircraft are usually equipped with highly accurate positioning systems, many linked to automatic photographic equipment that shows the position of the aircraft or target at the time the photograph was taken. Courts in some States have accepted this as evidence of the position of the vessel, provided that the prosecutors prove the circumstances under which the photographs were taken, developed, and stored so that the court is satisfied that they have not been tampered with. In the case of inspections at-sea, it is common procedure to take a position on the patrol vessel just prior to conducting the boarding. The fisheries officer should ask the vessel master for the position of the vessel upon boarding. If there is a variance, the officer should watch the master take another position fix. If the officer is not satisfied, it is recommended that an appropriately certified deck officer from the patrol vessel take a position fix on the boarded vessel. Enforcement officers should be on the alert for subterfuges and deceptive conduct by the crew of vessels engaged in illegal fishing. To avoid detection or to create doubt as to the vessel's actual position, Masters have removed a fuse from key navigation equipment, and have then claimed the equipment is not operational. If the navigational instrument is warm, a court may be prepared to infer that it has been used recently. Another method is to deliberately re-calibrate equipment to give a false reading. It is recommended that an appropriately certified patrol vessel deck officer take the fix on the boarded vessel if there is a discrepancy in readings from the position indicated just before boarding. This deck officer can then appear in court to give evidence of the position of the vessel if necessary. Today the inexpensive access to Global Positioning System equipment (prices being approximately US$250-US$1000) make the verification of fishing vessel positions easy to confirm (and more difficult for the fisher to refute). The requirements for VMS on the larger fishing vessels will also provide very accurate positioning information for fisheries officers. VMS and satellite technology have been discussed earlier and are key emerging tools for the fisheries officers, thus reducing the need for random air or sea patrols. Noting that not all vessels have such technology, it is incumbent on the fisheries officer to have a working knowledge of common marine navigational systems and techniques for fixing the position of the vessel. The officer must be able to detail the procedures used in determining the position and any methods used to verify the position of the vessel. This will form the basis for the verification of all vessel activities while in the zone, especially in the case of an alleged infraction of fisheries law in a closed area. Most larger vessels carry a variety of compasses (both magnetic and gyros) as well as radars, satellite navigation equipment, omega positioning gear, a sextant, direction finding equipment, echo sounders, fish finders and sonars. Navigation publications and area charts are also standard items. All such equipment and documents and the observation of their use and status on boarding the vessel can be very useful in court proceedings. For example, one could note if the radar has been set on a very short range, one mile or less, which could indicate searching for a transponder from a fishing buoy, whereas the safety range is 10 or 12 miles. The satellite navigation system often provides printouts of positions over a period of time and can show where the vessel has been. Radio directional finding gear should be compared to the frequencies for the vessel's fishing buoys and cross-checked with the course being steered. 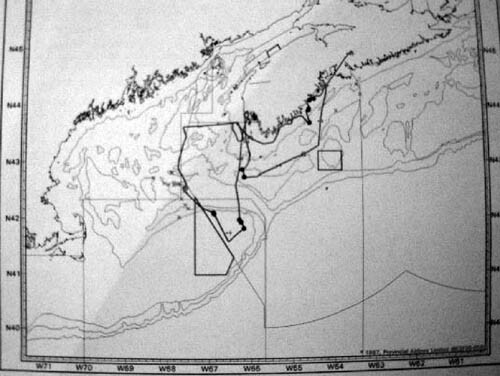 Echo sounders and fish finders could indicate the presence of fish being chased and markings on charts could assist in the determining the past course of the vessel. The charts and logbooks might indicate positions, fish catches, times when freezers were operated, engine hours and times of operation at what speeds and temperatures, etc. These observations can all assist in building and supporting a prosecution if a violation has occurred. Notations as to whether the gear was warm on arrival, signifying recent use, engines functioning properly on the return to port and navigation equipment suddenly working accurately could all be points to refute claims of malfunctioning gear. One of the most onerous yet important tasks for fisheries officers and administrators is preparing for, and successfully prosecuting, those who contravene fisheries laws. Prosecutions are an essential part of MCS. These actions will not only penalize offenders but also deter others from breaking the law. On the other hand, if fisheries officers obtain clear evidence that the law has been violated and the matter is not prosecuted, this can have a detrimental effect on the morale of enforcement officers and may encourage further non-compliance by fishers. Fisheries administrators and prosecutors are sometimes reluctant to prosecute all but the most blatant violations of the law because it can be a time-consuming task (particularly for senior officers) and the perceived risk of embarrassment if the case is lost. Although no administration is likely to have a 100% success rate, it is important to note that most of the expense and effort expended on fisheries MCS will be wasted if the fisheries administration is incapable of successfully prosecuting cases in court. Many fisheries prosecutions have resulted in the alleged offender being acquitted in court due to lack of proper preparation and training by the fisheries prosecutions team. It is essential for States to train officers and prosecutors in how to gather evidence and to prepare and present a case. Proper training can dramatically increase the success rate in fisheries prosecutions. Indeed, this is one of the most cost-effective ways of improving the effectiveness of MCS systems, particularly when every well-publicized successful prosecution is likely to deter a number of other violations. One way to improve the success rate of fisheries prosecutions is to compile standard training manuals and to conduct training courses with practical exercises. For example, both the South Pacific Forum Fisheries Agency and the ASEAN States have compiled standard manuals on prosecution procedures for their regions. It is important that the fisheries prosecutions team and the judiciary are well-informed about fishing, the fishing environment, the management scheme and its importance to the national economy, and the MCS activities required for the conservation of these resources. Prosecutions are often conducted by prosecutors employed by the Ministry of Justice (or an equivalent component of government) who may have little or no knowledge of fisheries. If this is the case, it is important to educate and train selected individuals before they are required to be involved in an actual case. One of the best ways of achieving this is to sponsor exercises and mock-trials which may be supplemented and supported by workshops and manuals. The advocate or prosecutor, judicial officers (e.g. magistrates and judges), fisheries officers, interpreters, patrol vessel crews and officials from other departments can all benefit from visiting a fishing vessel and taking part in a mock exercise in which a vessel is boarded, inspected, detained, ordered to port and charged. The moot court can also prepare all parties for the types of questions and explanations that a judge will ask of a prosecutor to ensure an understanding of the alleged infraction. The exercise can as well be used to test the effectiveness of institutions and established procedures in dealing with a detained vessel, cargo and crew. Fisheries administrators should ensure that their field patrol staff are trained to be very observant and to record their observations from the time the vessel is sighted until a decision is made to order the vessel to port or to permit it to carry on with its activities. Where appropriate, these records may be made in the logbook of the patrol vessel, but more detailed personal observations can also be recorded by officers in their notebooks. One of the most important reasons for recording observations when, or soon after, these sightings occur is that a court will tend to give greater weight to evidence of this nature. This is because courts generally recognize the fallibility of human memory and prefer to rely on "contemporaneous notes" (i.e. written accounts of events that were recorded at the time they occurred or soon afterwards). Furthermore, notes taken at the time can be of invaluable assistance to an officer who is called on to be a witness in a trial, particularly when the trial is held long after the actual event. Observations with respect to the activity on the deck of the fishing vessel when the patrol vessel comes into view are important. Hasty activity on the deck, dumping of gear or fish, fresh fish offal in the sea, sea birds feeding, ropes or gear over the side are all indicators of fishing. Photographs and videos with time and position notations are particularly useful to record this evidence. The more observant the fisheries officer and the more accurate the notes, the easier it will be to reconstruct the events to support the decision to prosecute the case. When making and recording observations the fisheries officer should always keep in mind the fact that the judicial officer will want to be able to understand events unfolding in chronological order through the explanation of the officer in court. With this in mind, the officer may wish to continually remind him/herself, "What is the judge going to ask?" or "How do I describe this?" For example, fisheries officers participating in an enforcement situation (or an exercise) that involves encountering and boarding a vessel suspected of illegal fishing should consider the following questions and record all relevant observations. When approaching any fishing vessel that may be involved in illegal fishing, an officer on the bridge of the patrol vessel should be assigned to note all activities during the approach and while the boarding team is on the vessel. Where appropriate the officer should note responses to the following questions in the ship's log. a) What is the time, weather, the state of the sea, the temperature and the direction of the wind and waves? b) What courses are each of the fishing vessels steering on the appearance of the patrol vessel, what is their speed and are there any changes when they recognize the patrol vessel? c) As the patrol vessel approaches, are there any signs that the fishing vessel is engaged in fishing activities? Examples of such signs may include: reduction factory working, winches in operation, radar operating, radio communications or echo sounders in operation (picked up by the sonar of the patrol vessel), or the absence of radio buoys from normal storage areas. d) Is there any evidence the vessel has been fishing? Examples of such evidence would include: fish on the deck or in deck bins, wet decks or fishing gear, dead fish or fish offal in the sea near the vessel; fishing gear, buoys or small boats in the water or on the vessel; lines over the side; bloody water or offal in the scuppers of the vessels; flocks of sea birds feeding on fish scraps; or fish activity on the surface of the sea in the immediate vicinity indicating the use of fish baiting. e) What are the deck crew doing on first sighting and is there a change in the nature or level of activity? For example, are they stowing gear, or dumping fish? f) What is the reaction of the fishing vessel when the patrol vessel communicates with it and orders it to prepare to be boarded? g) What activities are seen on deck when the boarding team approaches the vessel? (If hostile, the bridge officer must warn the boarding team). h) What happens on deck during the boarding team's inspection? For example, can the bridge officer identify any gear being switched off during the boarding? The minimum boarding team should comprise four, preferably six, persons including the fisheries officer, a member from the engineering department and a ship's officer. There should also be a boarding boat operator who drops the team and stands off the fishing vessel, prepared to pick up the team. On approach to the vessel the team should observe the activity on the vessel and note the presence of increased activity. In particular, the team should consider the following questions and record their observations. On boarding, the crew should still be observing the deck and activities of the crew. If the boarding appears to be unopposed, the fisheries officer and boarding team (except for one person who should remain at the head of the ladder), should proceed to meet the captain and identify themselves. Requests should be made for the fishing licence, ship's log, all fishing, processing and freezer logs, and the engineering log. Two members of the team should accompany the vessel crew when retrieving these logs, if this is possible. The activities ongoing on the bridge of the vessel should be noted at the time of boarding to determine if there seems to be a flurry of activity around the navigation chart or vessel logs. The settings on all navigational gear should be taken at this time. The inspection should then be carried out in accordance with standard procedures identified during the briefing. For example inspecting the fishing gear to determine whether or not it is hot from recent use, and looking for fresh fish in the freezers, wet fishing gear and blood in the production areas. Photographs are a rapid method of indicating the state of the vessel and gear on arrival on the vessel. The master must be asked to indicate the position of the vessel and to respond to questions regarding the activities of the vessel. If the inspection of the vessel and documents indicates that the master may be fishing in a closed area without authorization, the master is then ordered to take the vessel to port for further investigation. There are several opinions as to when the master should be informed that there appears to be a violation and of the appropriate legal rights available under the law. If the fisheries officer intends to ask the master whether he/she knew they were fishing in a closed area, or in an area in which they were not authorized to fish, this is effectively asking the master to make a self-incriminating statement. Consequently, the fisheries officer should inform the master of his or her legal rights (e.g. the right to remain silent if this is recognized under national law) before the question is asked since a failure to do so may mean that the master's reply cannot be used as evidence in court. On the other hand, if the officer is determining the position of the vessel and asks the master to indicate the vessel's position, there may be no need to inform the master of his or her rights until a decision to charge the master is taken at a later time. This is an important point in law and fisheries enforcement officers must be guided by the legal advice from their particular State on how to deal with this matter. The reaction of the master and the fishing crew when ordered to take the vessel to port is very important to the safety of the boarding party. The cooperation of the master in this process should be duly noted, as well as the performance of the vessel and its navigation and engineering gear. The MCS Central Operations Centre and appropriate port authorities should be notified of the vessel's passage to port and its expected time of arrival (ETA), so that arrangements for accommodation of the crew and security of the vessel and catch can be prepared. Preliminary documentation for court appearances can be drawn up on land and officials representing the vessel informed of the vessel's arrival in port. During the passage to port the fisheries officer should begin the preparation for the case. The points listed below should be considered. a) Is there a need for an independent expert witness (or witnesses) to check the state of the navigation gear, the freezers or the engine machinery? b) What evidence has been gathered and how strong is it? Has it been cross-checked and verified through different sources? c) What certificates are needed to use the evidence appropriately in the case? Have all statements been taken and were warnings read to each witness when it was decided to proceed in this manner? d) Which witnesses will be necessary to the case? Should they be interviewed on landing or at a later stage and who should be present? Will interpreters be needed? f) Has all the evidence including all exhibits been secured? Is there need for any more documentation? Are any other photographs necessary? h) What arrangements should be made for the preservation or disposal of the catch? i) Can this be settled through an administrative procedure or does it need to go to court? What might happen if the fine is too high (e.g. the owners may abandon the vessel), and what follow-up procedures would then be necessary? j) What are the procedures for setting bail for the accused and what is a reasonable amount? k) Where can the crew and master be accommodated? l) Have all the notes for the case been completed for use by the prosecutor? Armed with the answers to the above questions, the fisheries officer is ready to meet and brief the prosecutor and the Fisheries Administrator on arrival in port. This briefing should be chronological and thorough. At the conclusion, the fisheries officer should have a list of recommendations or action to be taken if a determination is made to proceed with the case. The master should then be formally charged, witness statements taken and certified, if not already completed, and the crew and master accommodated. An appearance date should be set with the courts for as early as possible and the vessel, gear and fish should be secured in a manner so as not to result in spoilage of the catch. Evidence from the air patrol and statements from the air crew should be obtained and certified. The prosecutor should review the evidence, exhibits and statements and then prepare the case for the appearance hearing. There have been cases where fishers took turns to raise safety concerns to get a tow from the patrol vessel, thus putting the latter out of the patrol zone for a period while all the remaining fishers fished in a spawning area. It has been found that in many countries, Fisheries Officers are not issued appropriate identification cards and rely solely on their fisheries hats or uniforms to identify themselves as MCS Officers with powers in accordance with their Fisheries Acts. It is strongly recommended that all fisheries MCS Officers be issued a picture identification card for their duties and this be so described in the appropriate legislative instruments. Radios are essential for operational communications of events and note taking onboard the patrol vessel of reports, as well as for safety reasons. Notebooks for boarding team with numbered pages and the patrol vessel logbook are two of the most important documents that will provide data of the events for possible future court action. Note-taking is an art that should be initiated early in any MCS training and continued throughout each boarding. Remember to: (i) use the notebooks only for official business; and (ii) cross out any errors with one line and continue writing, do not remove any pages from the notebook as it gives the court the impression of possible manipulation of evidence. The master of the fishing vessel may communicate that he/she will complete hauling the net or other fishing operations prior to boarding. If boarding would result in potential loss of fish or gear, the fisheries officer should respect this request. The fishing vessel may stop, but experience has demonstrated that it is actually easier for the boarding boat and team to get on the vessel if the Captain keeps some way on the ship in the range of a few knots. It is possible to board comfortably at fishing speeds, but speeds above 10 knots become more difficult, even for an experienced team. e. measurement should be in the middle of the net away from any strengthening ropes. For example the FFA Fisheries Prosecutions Manual (Coventry, 1991) provides a very useful guide for fisheries officers in common law jurisdictions who may have to prosecute a case. Contact details for the FFA are given on their website: www.ffa.int.